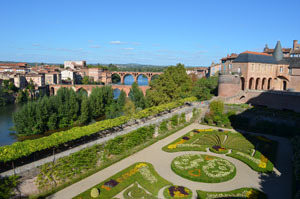 Our last day in southern France, we tour Albi France and then fly north to Lille. From our hotel in Béziers we made our way up the A61 autoroute waving goodbye to Carcassonne France in the distance. We arrived in Albi in time for lunch. 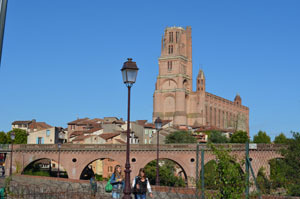 Albi is orange, built of bricks. Very beautiful. We found a restaurant for lunch, le Parvis, sitting in the shadows of the cathedral. A sign outside indicated that they pride themselves on old classic French cooking. Had a delicious (although rich) prix fixe lunch of Skate. After lunch we went to Musée Henri de Toulouse-Lautrec (Toulouse Lautrec museum) housed in the Palais de la Berbie, former palace of Albi’s archbishop. Toulouse-Lautrec was born and raised in Albi. After his death his mother donated his art for this museum. It is the largest most complete collection of his work in the world. With drawings from his earliest work at the age of 11 it was fascinating to follow his growth as an artist. An added bonus, the museum’s gardens outside are stunning. 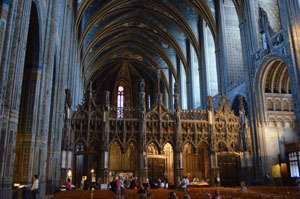 Next stop Cathédrale Ste-Cecile (Albi Cathedral). A beautiful, huge cathedral built of red brick. The Church wanted to show how important and powerful they were after the Albigensian (Cather) crusade (massacre) in 1265. Took huge amounts of money to build. I have never seen a church like it. I would have liked to have had a full day to stroll the beautiful streets and relax but we needed to catch a flight. Our next stop takes us to Toulouse airport and our flight to Lille France in the north to visit relatives. Look forward to their warm welcome and a wonderful visit with family. Farewell southern France. Our visit here has come to an end for now. A bientôt.